When my wife learned that her former boss, who is not that old, suffered from his first heart attack, she wrote me a quick e-mail trying to make an example of the guy who was working too hard and taking all of the things way too seriously. Where some might have suggested a good workout once in a while, her recipe was to have fun on the job. Opinions may vary about Gamma Ray, especially some latest output, but if there was one band which was following my wife’s advice, and thus was in no danger of heart attack, it would be this crew. 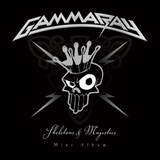 Bridging the gap between albums and filling that bucket of fun to the brim, Gamma Ray is out with the new EP called Skeletons and Majesties. Breaking the things down between rocking and acoustic, the band has trotted out some very old cuts (from the Ralf Scheepers era) and added the acoustic touch to others. The Skeletons are revealed in the form of Hold Your Ground (Heading for Tomorrow) and Brothers (Insanity and Genius). While Kai Hansen appears to be in fine form and follows his usual mocking fashion, the songs rock pretty hard, almost too stadium rock-like, Gamma Ray in danger of stepping on Twisted Sister toes with this rendition of Brothers. Flashy and self-indulgent solos (as if you expected anything else) make appearance as well. The Brothers sing-along chorus is one not to be missed after you had beers with your old college friends. The acoustic Majesties were quite a bit more to my liking, and that maybe due to the songs being covered. I always thought that Send Me a Sign was a catchy track from an underrated album (Power Plant) and Rebellion in Dreamland (Land of the Free) is one bona fide epic. Whereas piano touches, even if done in the lounge style on Send Me a Sign, add playful flavor and sound warm atop the bumbling bass, the vocals were a turnoff on Send Me a Sign. Standoffish and uninspired, not quite spoken and not quit sung, they were a lot better on the original. Rebellion in Dreamland is one Gamma Ray cut which almost begged for an acoustic do-over, so all notes on that song hit the spot. Flamboyant guitar and an interesting piano solo to finish make this rendition the best song on the EP. The rare song Wannabees and another, only longer, version of Brothers are bonus cuts, and somehow I question the wisdom of having two editions of Brothers on what is strictly a stop-gap EP. The karaoke version of Rebellion in Dreamland, which closes Skeletons and Majesties, could be a cool thing to have when you have a lyrics booklet in hand to try your hand filling in Kai’s shoes, and some here-and-there verbal markers are given throughout the song to keep the “performer” in you oriented. To finish where we started, with the fun aspect, the all kinds of vocal impressions follow the empty portion of the last track, to show that being serious was the last thing on Gamma Ray’s mind while recording this.